Return Man 3 | Play Unblocked Game Online !!! 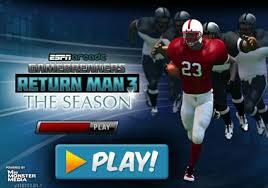 Return Man 3 is the third sequel to the Return Man free-to-play online game series. In this game, you play as the punt returner for your soccer team. The main aim of the game is to get past the rival team and score a touchdown. Press “I” on your keyboard to move forward, “J” to move left, “L” to move right and “K” to go back. The moves can be used by pressing the A, S or D buttons. This current version is already unlocked, so you can play it no matter where you are and enjoy all the benefits it has without any limitations. As the game progresses, it becomes increasingly difficult to reach the touchline. When it happens, try to reach power-ups as soon as possible to gain an advantage over the rival team. Run close to your teammates for them to shield you from tackles from defenders. Be quick, fast and always keep an eye out for the last man who may pop out unexpectedly.